by Brian Hutt - Christianity Today. Tuesday, February 22, 2011. EU foreign ministers have issued a statement condemning violence against Christians and calling upon states to protect freedom of worship. The statement was issued after the Foreign Affairs Council Meeting in Brussels yesterday. The foreign ministers said: “The Council expresses its profound concern about the increasing number of acts of religious intolerance and discrimination, as epitomised by recent violence and acts of terrorism, in various countries, against Christians and their places of worship, Muslim pilgrims and other religious communities, which it firmly condemns. The ministers expressed their condolences and “solidarity” with the countries where religious violence was being experienced, as well as the victims. They went on to affirm the EU’s “strong commitment” to the promotion and protection of religious freedom and called upon states to protect citizens, including members of religious minorities. “All persons belonging to religious communities and minorities should be able to practice their religion and worship freely, individually or in community with others, without fear of intolerance and attacks,” the statement continued. “The international community needs to consolidate its collective response to those who want to use religion as an instrument of division, fuelling extremism and violence. The reference to Christians was included despite the previous reluctance of some foreign ministers to single Christians out for special mention. According to European Dignity Watch, five foreign ministers and EU High Representative Catherine Ashton had refused to make any mention of Christians in a statement on religious violence at the last Council meeting in January, despite the wave of attacks on Christians in the Middle East in recent months. Christians across the Middle East have experienced an intensification of persecution in recent months. 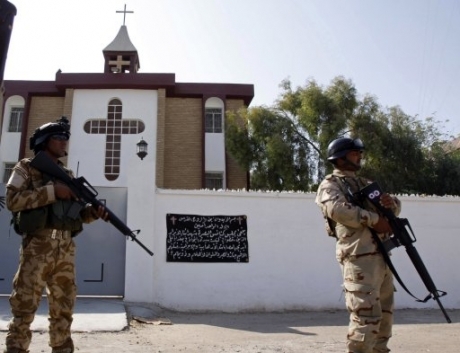 In Iraq, dozens were killed when gunmen opened fire inside the Our Lady of Salvation church in Baghdad last October, while in Egypt more than 20 Christians were killed in a bomb attack on a church in Alexandria on New Year’s Day. Both attacks were followed by random deadly attacks on Christians. European Dignity Watch welcomed the statement but criticised the foreign ministers for making only a single reference to Christianity. The advocacy group said the Council had produced a “carefully worded” and “politically correct” statement. “A more courageous message on the part of the European Union would have unequivocally condemned the atrocities committed exclusively against Christians,” it said. However, the group added that the statement would be welcomed by victimised Christian minorities in the Middle East “who need the ongoing support and solidarity of the EU”.